Are you intrigued by the rapid technological advances being made in fields like biometrics and nanotechnology? Do you marvel at inventions like self-driving cars and tissue regeneration and wonder what the near-future holds for everyday technology users? Look for continued innovation within the drone sector. From aerial photography and site inspections to aerial robotics and agriculture management, drones are becoming an increasingly popular means of service delivery. Almost makes you think Amazon was onto something, right? From the Apple Watch and Moto360 to fitness trackers and health monitors, wearables are going to be everywhere in 2015. Combine the flood of wearable devices with the increasing trend towards open-source technology and APIs, and you have a recipe of massive influx of apps for wearables. Developers are already innovating within the Android Wear sector; expect this to explode once the Apple Watch is available to the general public. 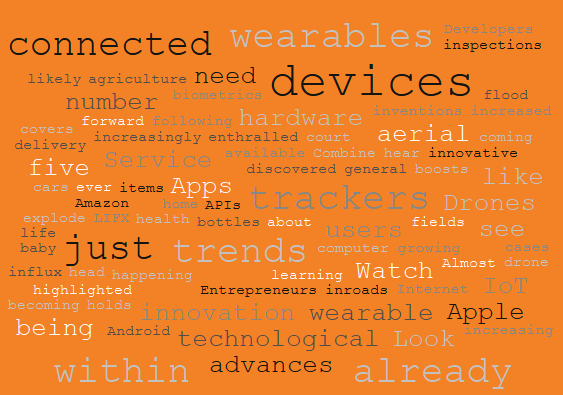 Our wearable trackers aren’t going to be the only connected devices we use in 2015. From smart technology baby bottles to IoT weather sensors, the items in our home are going to be more connected than ever in the coming year. If you think Nest and LIFX were innovative, just wait until you see what the IoT sector has in store for you. As society boosts their usage of connected devices and tracking/monitoring hardware, look for an increased need for data privacy tools and services. Data from fitness trackers is already being presented in court cases (theguardian.com/technology/2014/nov/18/court-accepts-data-fitbit-health-tracker); expect there to be a growing need for data privacy tools to protect user data. From machine learning and speech recognition to computer vision and robotics, artificial intelligence is going to be everywhere in 2015. If you’re already a slave to your smartphone, you might want to pull the covers over your head as machines make continued inroads into your everyday life. These are just five of a number of tech trends that you can expect to see highlighted in the media in 2015. Entrepreneurs are rapidly innovating in a number of sectors; from hardware to software, there are many technological advances just waiting to be discovered by mainstream users. Which of these tech trends are you most looking forward to?